Hello friends! I have another ridiculously easy crock pot recipe for you to try! I loved this chicken. It had tons of flavor and was a nice little change-up to the every day barbecue chicken we all make. The recipe calls for a bottle of your favorite BBQ sauce and some extra additions that make it taste amazing! We ate this with a side of veggies and loved it. Next time, I think I’m going to shred the chicken and make us some BBQ Chicken Sliders with it. Oh yeah! 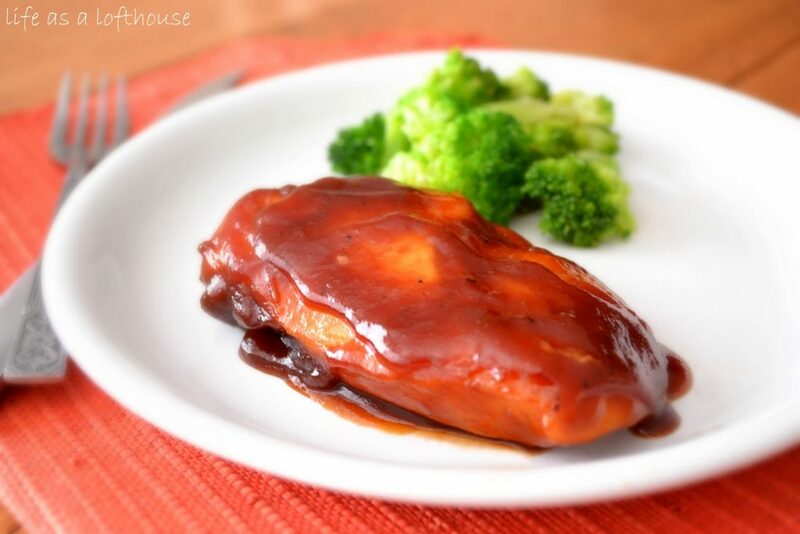 Delicious and super easy Barbecue Chicken cooked in the crock pot. Place chicken breasts in the bottom of greased crock pot. In a medium bowl mix together barbecue sauce, vinegar, garlic powder and red pepper. Stir sauce and then pour over chicken. Sprinkle with brown sugar. Close with lid and cook on low for 3 hours. (The last 30 minutes of cooking, remove the lid from crock pot and let water evaporate to thicken sauce) Serve! Looks easy and yummy – I like that it has a little kick, too! 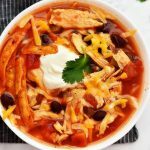 What a great idea for crock pot chicken! i love simple dinner dishes like this, a crock pot is my best friend! I notice you cook a lot of broccoli. Broccoli is my favorite too. I make it as my side veggie for most dinners 🙂 Your blog is amazing. I look forward to all the recipes you post. I’ve made a ton and haven’t been disappointed yet! Keep up the great work. Love the sound of this chicken…would make a lovely dinner! Thanks for stopping by my blog. I just spent time pouring over yours. You have some wonderful recipes! I’m now a follower! Can’t wait to see what else you create! This looks droolworthy! Love crockpot dishes. My hubby loves BBQ….and such an easy way to make him happy! This looks super simple and really tasty. All I need is some bbq sauce. I’m from SLC and I remember bbq chicken dishes like this over rice my grandma use to make. So good! That looks fantastic! The easier the better. I am try this one Holly! This looks perfect. I love easy tasty recipes like this. This looks so delicious..loved it!! Looks delicious! I just posted a recipe for Barbecue Chicken. 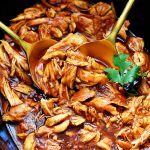 To make it in the crockpot, I use chicken breasts like you do, and right before serving, I shred the breasts while they are still in the pot, with two forks and voila – pulled chicken barbecue sandwiches. Great with cole slaw on top and be sure to use good rolls for the sandwiches. Enjoy! I have to leave in crock for 8 hours while at work will this be very dry and not worth cooking????? Patricia, I wouldn’t leave it in for 8 hours. It will be extremely over-cooked. WOW! I made this recipe over the weekend! All of the family LOVE it! They want me to make it again on Saturday! Once the chicken was done I let it cool, and shredded it just like pulled pork. YUM YUM!! LOVE your recipes! !